In this article we address the Top 10 Misconceptions About Perfume and hopefully correct the most common held fallacies. Fragrance is one of those subjects which is frequently misunderstood and many myths form around some of these misconceptions and mistaken beliefs held about perfume. Does Fragrance Go Bad ? A typical fragrance contains a large amount of alcohol, regardless of whether it is an Eau de Cologne, Eau de Toilette or an Eau de Parfum. One of the great features of alcohol is its ability to preserve fragrance ingredients and at the same time prevent any bacteria from forming over time. However having said this, what is correct is that fragrance ingredients do breakdown overtime and the typical life expectancy of a Perfume is approximately two years. This can vary however depending on the perfume. What better reason is there to use and wear your wonderful Perfume on any and every occasion, to prevent it from reaching it’s end of life date. How you store your Perfume will also effect its longevity as exposure to sunlight and varying temperatures will cause the ingredients within the perfume to change. Equally, exposure to heat or noticeable temperature fluctuations will change the odour profile of your fragrance. Cologne Is Only For Men ! Some people think that an Eau de Cologne is only for men, and an Eau de Toilette is solely for women. Instead, what is correct is that these two terms only describe the perfume oil concentration inside the bottle. An Eau de Cologne will be lighter or contain less pure oil than an Eau de Toilette. Eau de Cologne and Eau de Toilette are gender neutral, as are Eau de Parfum, Parfum and Extrait. A cologne might sound more masculine, but it is merely the name or word used to describe a profile of a Perfume. Does Fragrance Have To Be Stored In The Bathroom ? Moisture, sunlight or heat will affect how quickly essential oils break down, regardless of whether they are natural or synthetic, expensive or cheap. The idea that your perfume can only be stored in your bathroom may not entirely be untrue, that is if your bathroom is one of the slightly cooler or darker places in your home. In this case, it would be a good place to store your fragrance. A cool storage area or a fridge is the optimum place to store your Perfume, but do not go as far as placing your fragrance in the freezer. Another excellent place to keep your Perfumes is in a drawer, however it is such a pity to be unable to see the beautiful bottles in which they are presented. So again, unlike good wine that you wish to store in optimal conditions for a long period, we believe Perfume should be displayed in pride of place and worn on every occasion. Perfume Smells The Same On Paper As On My Skin ! We all enjoy passing through duty free on our way to a lovely vacation or visiting the perfumery counters of our favourite department store. All of the beautiful perfumes are being presented to us on paper smelling strips. Hence, it is very good question: Why are they doing this ? Will it actually smell the same on my skin ? The answer is quite simple: presenting fragrance on a paper smelling strip is a hygienic, cheap and fast way of sampling a new scent. It also allows you to take it with you and experience how it develops over time. You will find that you gradually discover base notes or other facets of the perfume which were not immediately obvious when you initially trialled the perfume. The presence of the initial alcohol also makes it a little difficult to fully appreciate an odour profile. When you like how a fragrance develops from the smelling strip, we all like to test it further by wearing it. This is where your personal or natural body odour profile comes into play. ‘Body odour’ may not sound very pleasant but our skin has natural oils, healthy bacteria, skin cells and many other elements on its surface. All of these have an impact on how a fragrance develops on your skin. The skin is unique to each and every one of us. We may find that a scent smells familiar on one of our friends or colleagues, but you will also notice that your favourite perfume can have a completely different character when smelled on somebody else. 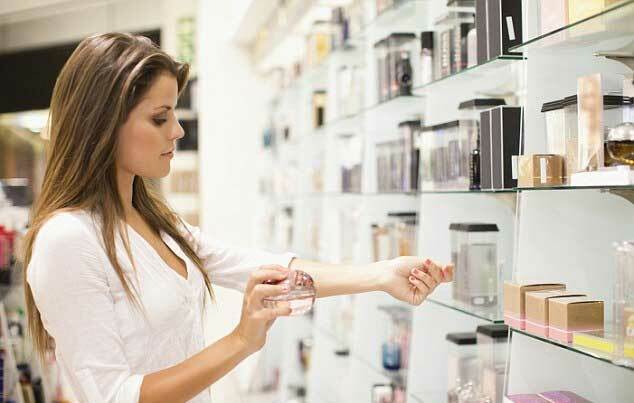 Have you noticed how your fragrance smells different from one day to next? Here other factors come into play such as the last meals you consumed, the current weather or climate and your general sense of wellbeing. Even simple things such as taking a shower will alter your perception of fragrance. Let’s say you have enjoyed a lavender scented shower gel. Do you notice how you are then suddenly much more tuned into perceiving lavender in many other products ? See whether you like a perfume on the smelling strip not just initially, but also after it has had time to develop. If you enjoy the fragrance from the paper, then you may like to apply a little to your skin to see how it works for you. Et Voilà – now you know that what you were doing all along was correct, and that you should keep on doing it. (If not, then now is an excellent time to start). Spray The Perfume In The Air And Walk Into It ! You may have heard this recommendation, and it is indeed a very nice way to apply Perfume, if a little extravagant as you will have fragranced your room along with yourself. Some may find that it is a little wasteful, but you will smell fabulous from head to toe. So when you are just about to leave on your way to a special occasion, or an everyday occasion why not spray your Perfume in the air and immerse yourself in your World of Perfume. These are naturally warmer areas of your body and the aura of the scent will radiate from them throughout the day. One piece of advise: no matter how much we adore our perfume, it is better to not over do it. With fragrance, the old wisdom of ‘less is more’ really does apply (excuse the pun). ‘Parfum’ Does Not Contain Alcohol ! When we refer to ‘Parfum’ in the title above or in this section, we are referring to the Perfume concentration within any given perfume format, visit any department store or specialist Perfumery, and you’ll find Parfum, Extrait de Parfum, Eau de Parfum, Cologne, Eau de Toilette, Aftershave, these are distinguished from each other by their Perfume Oil concentration. When someone states that ‘Parfum’ does not contain alcohol, this is actually incorrect and leads to a broader question about fragrance oil concentration. The main difference between types of fragrance lies in the concentration of essences. The order of highest to lowest concentration is first Extrait, second Perfume, third Eau de Parfum, fourth, Eau de Toilette, and fifth, Eau de Cologne. … Perfume is very expensive because it can have up to 40% concentration of essences, however even with this high oil content, it still contains alcohol. The remaining balance in these formulations is for the most part alcohol with a small addition of some colourants, skin emollients, solubilisers and other additives. Would a Parfum without alcohol not be nicer? not necessarily, as the alcohol lifts and adds freshness to the olfactive profile. It would last slightly longer, but the fragrance would probably feel a little ‘dull’ or ‘flat’. Don’t Rub Your Two Wrists Together ! We have all done it: we applied perfume to our wrists and then rubbed them together. There is nothing wrong with this approach, as it helps to spread and work the scent into the skin. There is only one downside with this: alcohol degreases or disolves the natural skin barrier and slightly opens the pores of your skin. Some people with sensitive skin may find that this irritates their skin. In this case or if you simply like to avoid this risk, we would recommend that you let the scent sit on the skin and gradually develop on its own. The benefit of rubbing your wrists together, is that it helps the fragrance to remain longer on you skin. All Fragrances Are Equally As Strong ! The short answer is: no this is not correct but there are a few more facettes to this statement. We spoke earlier about the different fragrance oil concentrations and it become self-evident that a ‘Splash’ cannot be as strong as an ‘Eau de Parfum’. You don’t need to apply as much of an ‘eau de parfum’ as you would naturally use of a ‘splash’. Sometimes the perception of ‘strength’ is a question of a distinct period of history or era. In the 80ies the fragrance Poison was very popular and nobody felt it was overtly strong. By today’s standards, it would be considered very strong. Another aspect is the character of the ingredients themselves. For example, ‘lemon’ will typically seem rather strong because it has a sharp, zesty nature. Alternatively, ‘vanilla’ may come across as being weaker due to its warmer and more rounded profile. On the other hand the ‘lemon’ scent will disappear quickly, while the vanilla note can last for days. Based on this, which would you say is stronger? In our opinion, strength is very much a personal assessment. If you believe that something is strong, then obviously it is, irrespective of what experts say. A perfect example for this is musk. Some people cannot smell it. They are anosmic to musk. Others find it very strong. Who in this case is right? Actually, does it matter who is correct? What we can state quite clearly though, is that not all fragrances are equally as strong. A Good Perfume Is A Strong Perfume ! You saw earlier that the more expensive grades of perfume (e.g. eau de parfum, parfum, extrait), contain less alcohol and these tend to be stronger than a simple splash cologne. But what makes a ‘good perfume’ ? The concentration of pure perfume oil in a bottle will determine its strength and longevity when you wear it. This does not make it a better perfume. Depending on the scent you are choosing, a greater or lesser strength might suit you better, as the amount of alcohol affects the olfactive profile. In other word, it is not uncommon for a fragrance to smell very different when you try a different concentration, i.e. an eau de parfum versus an eau de cologne. A perfume with a higher fragrance concentration will naturally smell more powerful and you won’t need to apply as much. When You Can’t Smell Your Own Perfume Anymore Its Gone ! Our noses get used to our fragrance, and like background music, we switch off and tune out of own scent. Our sense of smell was developed to warn us of imminent danger: a fire, food that has gone off, the presence of another animal, etc. Just because we can’t smell our own fragrance any longer, it does not mean that those around us won’t notice it or that it is no longer perceivable. Only A Cheap Perfume Changes During The Day ! This statement is simply wrong. others master the art of a perfume that seems to be changing constantly and offers new surprises and pleasant facettes of itself as time goes on. Both types can be of the highest quality and what matters more is whether the resulting fragrance is pleasing. If a perfume is non-linear and changes over time, then this evolution of the scent throughout the day has to be carefully choreographed by the perfumer. If the change only occurs by chance or because cheap aroma compounds were used, then the result tends to be unpleasant like an underwhelming meal. Only Expensive Perfumes Are Good ! Generally, as a ‘rule of thumb’ this statement holds true and yet quite a number of inexpensive perfumes may be more pleasant than the designer scent of a famous brand. A famous saying goes ‘beauty is in the eye of beholder’. if you love a scent, then it is good, irrespective of its price tag. some of the most famous fragrances, have not necessarily been the most expensive. Another adage also applies to perfume: ‘don’t be penny-wise and pound stupid’. Christian Dior famously stated that “a woman’s perfume tells more about her than her handwriting”. Perfume is part of your personal signature or your wardrobe. It is a vital element of your personality. Apply the fragrance that corresponds to your mood or feelings for the day. The best advice we can give is to try a perfume on paper and then on your skin, do this as often as you feel necessary and if you find that this fragrance is ‘you’, then don’t worry about the price tag whether it is large or small. Have the confidence to buy and enjoy how you feel when wearing it. What better way to start the day than applying a spray or two of happiness. Perfume becomes so much a part of our memories, not just our own but also our partner’s, children’s and friend’s. Like perfume it is much nicer to have good memories than bad ones. Just one word of caution, If something seems too good to be true, then it normally isn’t. We close this article with the hope that we have answered one of your questions amongst the ‘Top 10 Misconceptions About Perfume’and that you feel more confident when buying your next fragrance, regardless of whether this is a Home Fragrance or an Eau de Parfum. “Perfumery is an art and when you choose to buy a painting it is wise to choose a ‘Good Artist”‘.